The wind was SW about 14 mph, but at least it was not raining tonight. Mike N set a long beat down to 3 then 2, 4, 8, 6, 7 and back through the start. At the end of the first lap Ian C (Supernova) crossed the line in 1st with Jon and David C in Lasers crossing the line together battling for 2nd place. By the end of the second lap Ian had established a clear lead over David with Jon 3rd, but Newton (Solo) was hanging on to 4th place ahead of the Lasers of Curtis and James. Nev & Sally (Leader) came through next in 7th, but were being caught by Ellen in her Radial with Edward going well in his Topper next through the line. The next three boats of Peter S (Byte), David M (Radial) and Luke (Radial) crossed the line together. Alistair S (Laser) retired on this lap, but towards the rear of the fleet Jo and William were battling in their Toppers just behind Dean and Nick in the Vago with Rhys in his Topper and Rick (Radial) further back. At the end of the second lap Edward and Rhys received the finish gun. Chris & Carol (420) retired on the third lap as did David C moving Jon up to 2nd place and Newton to 3rd. Ellen gained four places to 4th and Luke who was having a close battle with David M moved up to 8th with David 9th. Mike A (Lightning) and Peter S were also having a close race passing and repassing one another. At the end of the third lap Jo, William, Dean & Nick and Rick received the finish gun. On the last lap the three leaders were in the same order, but James managed to finish ahead of Ellen and David M had repassed Luke and Peter repassed Mike. Nev & Sally won the battle of the Leaders finishing in 7th with Hugh & Hadey in 12th place. The final positions on the water were 1st Ian; 2nd Jon; 3rd Newton; 4th James; 5th Ellen; 6th Curtis. Thanks to Mike N and the OOD Team of Paula, Jayne, Mike C, Colin H, Tony R and Mike T.
The wind was light from the south and Peter S used a Tektona start to 2S, 3S, 4S, 9P, and 5S for both races. In the Pursuit Race the slower boats got away well and Hadey (4.7) and Chris A (Solo) took some catching. Ellen & Newton (RS200) got a good start and managed to hold off Ian C (Supernova) as he tried to catch them towards the end. The final positions on the water were 1st Ellen & Newton; 2nd Ian C; 3rd Hadey; 4th Chris A; 5th John W (Laser); 6th Luke (Laser). The rain came for the second Handicap Race and with that the wind dropped almost completely. Many boats were stalled on the line as the start gun went. Newton & Ellen drifted onto the outer mark and then sailed clear with the others left on the line and they were still clear in the lead at the first mark even having done penalty turns! At the end of the first lap Newton & Ellen still led but Ian C was not far behind and he was followed by the Lasers of Luke, Mark B, and John W. The Leaders were next through with Nev & Issy just leading Sally & Paul and they were some way ahead of Steve P (Laser) and Chris H (Comet). The early leaders in the Pursuit Race came through next with Chris A and Hadey crossing the line together and they were followed by David M (Laser), Adrian (Vago) and Paul W (Radial). In the light winds there was not much overtaking over the next two laps and although Ian managed to take the lead he could not pull away enough to beat Newton & Ellen on handicap. The final positions were 1st Newton & Ellen; 2nd Ian C; 3rd Luke; 4thMark B; 5th Nev & Issy; 6th Sally & Paul. In the Pursuit Race it was Ellen’s first race victory and there are now three girls in the top 6 in this series, with Karen 3rd, Ellen (& Newton) 4th and Hadey 5th. Perhaps the girls are better catching the boys than the boys are at catching the girls ? 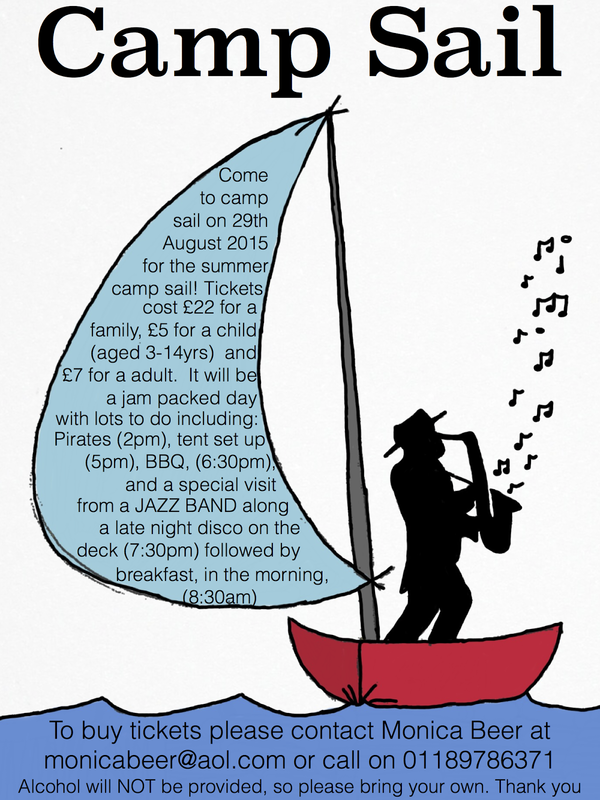 We have only 9 tickets left for the campsail this weekend. Details below. What a gloomy miserable night with the rain throwing it down and the wind on the light side again. Despite the weather there were 17 starters and 17 finishers ! Good to see Issy and Ross back on the water for the first time in a while but what a night to make a come back ! With a SW wind between 6 and 10 mph Paul R moved 9 slightly further down the lake and used that as his first mark followed by 4, 8, 6, 7 and back through the start. The leader on the first lap was Karen (Laser) followed by David C (Laser), Ian C (Supernova) and Newton (Solo). Then coming through together were the Lasers of Dave L and Sylvia followed a little further back by Ellen (Radial) then the Lasers of Ross and Curtis. Sally and Stuart (Leader – the only double hander out tonight) came through in 10th place being chased by Issy (Radial),David M (Laser) and Julian (Solo), these three came though line abreast. Rick (Laser) was going well, but he may have been sailing a slightly different course to everyone else ! At the rear of the fleet were Mike A(Lightning), Hadey (4.7) and Alistair S (Laser). By the second lap Ian had gained a lead which he held through to the fifth and final lap, behind him Karen and David C were trading places for 2nd and 3rd all the way through the race. It looked as if David had pulled out a lead on the third and fourth laps, but Karen came back to pip him across the line. On the second lap Ross and Curtis moved up to 7th and 8th by passing Ellen and David M had gained two places up to 10th. Remarkably the boats then occupying 4th to 10th places maintained these positions through the remaining laps to the end of the race. Lower down the fleet Issy had a great battle with Sally & Stuart, Julian and Mike gained a few places to finish 11th and 12th, but they were guilty of loitering on the line to ensure that Ian lapped them at the finish !. Hadey and Alistair eventually managed to get past Rick. In the end everyone enjoyed some close sailing despite the miserable weather. The final positions on the water were 1st Ian, 2nd Karen; 3rd David C; 4th Sylvia; 5th Dave L; 6th Newton. None of these positions are likely to change on handicap. Thanks to Paul R and the OOD Team Hugh, Roland L and Martin W.
The wind had not improved for the second race of the day and if anything was swinging around more. Half the fleet completed two laps and half one lap. Ian C (Supernova) managed to break away on the second lap and finished well ahead of everyone else. The following four positions were filled by Lasers with Chris H (Comet) in 6th place and Newton& Ellen (RS200) in 7th. Jon decided to retire halfway round the second lap as he could not take any more excitement ! The final positions on the water were 1st Ian; 2nd David C; 3rd Curtis; 4th Karen; 5th Dave L, 6th Chris H.
On Handicap the leading four should remain the same, but Chris should move ahead of Dave. The wind this morning was very light, about 2 – 3 mph NE, although the strength and direction varied considerably throughout the race, at times going through more than 180 degrees. Mike A used a Tektona start with a similar course to Wednesday night – 8, 5, 9, 4, 3, 2 and back through the start, but with hindsight could have done with a shorter course ion the light winds. There were 17 starters for the Pursuit Race and in the light wind no-one actually completed a lap ! At the finish gun the positions were Ian C (Supernova) in 1st place; then the Lasers of David C 2nd; Curtis 3rd; Dave L 4th; Karen 5th; Jon 6th. With the wind in a tricky direction, NE varying 6-10 mph, Bob L used a Tektona start with a first beat back to 8, up to 5, down to 4 then 2 and back through the start. There were 24 starters and it was good to see two new starters Richard Hobson in a Laser and Comet 587 (no name as yet) There was a familiar 1, 2, 3 at the end of the first lap, Ian C (Supernova), David C (Laser) and Karen (Laser), slightly ahead of Monica (Europe) and Sylvia (Laser) who crossed the line together. There were four Leaders out tonight and Hugh and Hadey (just back from the World Scout Jamboree in Japan) came through in 6th with Neville & Paul back in 14th and Sally & Stuart 17th and Tracey & Barbara 19th. Mike A (Lightning) came through in 7th being chased by Rod and Curtis in Lasers and Julian in his Solo. The other Solo of Chris A was locked in a battle with the Lasers of Chris S, Alistair S, David M and Paula (Radial). Then there was a mini fleet of double handers led by Sally & Stuart with Tracey & Barbara (Leaders) and Angela & Catherine B (Comet Duo) and Craig, Rob & Colum in a Firefly, Dean (Laser) was trying to get free of this battle. At the rear of the fleet Comet 587 was being caught by Amy in her Europe and Richard H was fulfilling his intention to potter along at the back and see how things went. Although the winds were light there were some really good battles right through the fleet. Ian managed to pull a lead and stayed out in front for the whole of the race but the battle for 2nd place was closely contested by David, Karen and Sylvia. Rod moved up to 5th place but was harried all the way by Curtis in 6th and behind them Chris A and Mike A had a terrific scrap for 7th place which went all the way to the line. Chris S, Alistair S, David M and Paula were also close together and joined by Dean in the latter stages and Sally & Stuart had eased slightly ahead of the other double handers to join this melee. Unfortunately Monica who had been going well in 4th place suddenly capsized on the way down to 2 on the second lap and as it happened so suddenly it looked like a gear failure. At the end of the fourth lap Angela & Catherine, Comet 587 and Richard received the finish gun and at the end of the fifth lap so did Julian, Dean, Sally & Stuart, Alistair S, Chris S and Amy. David M and Paula had sailed a good race in company coming through from 15thand 16th on the first lap to finish 10th. and 11th Dean after a dodgy start climbed from 18th to 14th. Rather cruelly Nev & Paul just pipped Hugh and Hadey on the line (by only 1 second – must have been the jet lag kicking in !)) to take the honours in the Leader fleet. Amy after another dodgy start climbed from 24th to 19th. The final positions on the water were 1st Ian; 2nd David C; 3rd Sylvia; 4th Karen; 5th Rod; 6th Curtis. On handicap the first three should be safe, but Chris A and Mike A might leapfrog Rod and Curtis.